Cable Technical Services is a privately owned, Texas-based full service contracting company providing a wide range of up-to-date technological services. With more than 25 years in the voice, data, and video industry, Cable Technical Services is registered in multiple states and growing nationwide each day. 1. Dynamic pages: Each page of text can be edited through an admin backend tool. 3. Employee portal: Employees can view forms and purchase company items in a password-protected area. 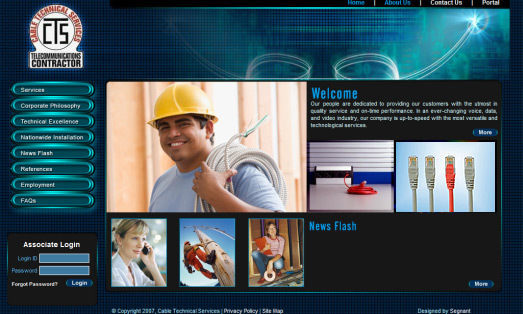 Segnant created a sleek design and a dynamic backend tool for updating the site pages for Cable Technical Services to enhance the company's image.